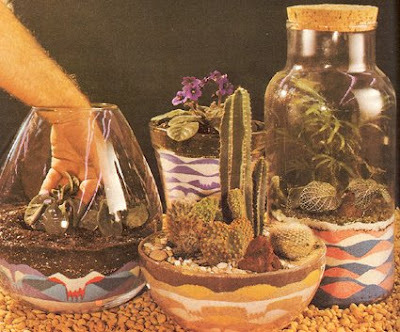 Check out this great post at the Naughty Secretary Club on vintage terrarium guides! I love all the variety but I have to say- I am most impressed with the sand painting terrariums! I remember doing "sand painting" in baby food jars when I was a wee one- except the only shapes we ever made were 'mountains.' These are spectacular! I would love to do a succulent dish garden with some bright sand now! What a fun blog that is. hilarious photos... make me feel a bit queasy for some reason! The sand painting ones are my faves by far, if I could have scanned the entire book I would have. Just got back from the thrift store and they had a vintage book on terrariums, it took all my will power not to get it and update the post with more pictures. Luckily for my wallet the book was in black and white. Thanks for the mention! Jennifer- those sand ones are so phenom. I definitely need to try it now. Do you have the Sunset Gardening book terrarium book from the 70's with the little Mayan-sculpture dude on the cover? I have it and it is so fun. I scanned some of the illustrations to post on my blog (some here: http://www.thefernandmossery.com/2009/03/1970s-sunset-gardening-terrarium-book.html) but I'll scan more of the photos for you if you want a peek!